The North Leeward Sports Association St. David cricket team has a challenge on their hand to avoid relegation from the RBTT Premier Division cricket competition next year. The North Leeward Association has been known for its sporting output over the years with its athletes on the track, field, or court making their mark. The performance of the St. David cricket team now is no exception. Led by former Under-19 left handed opener Alex Bowens, they outplayed their opponents to secure the title. Bowens collected the trophy on behalf of his squad at the awards and presentation ceremony on November 19. Meanwhile, Julius Anthony, chairman of the North Leeward Sports Association, says he is confident the team will give a good account of themselves next year. While the tournament is expected to start in February, before that, the focus will be on the local Cricket Association Annual General Meeting. 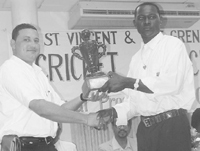 Victors are the defending RBTT Premier Division Champion, having won the title for the past three years.